Since we started dating our senior year of college, both of us have changed quite a bit. For Scott, who grew up in a small-ish Southern town, being married to someone with a completely different upbringing and traveling the world has made him a much more open-minded, curious and compassionate person. Also, he's stopped wearing flannel shirts all the damn time. Me, I've soaked up some of Scott's DGAF about what other people think attitude, which has allowed me to feel more comfortable with my authentic self, and do scary things that risked public failure (hello starting a business). As we've changed, our relationship has changed. At first, I used to freak out, like "ARE WE GOING TO BE OKAY??" level freak outs. But now, I'm kinda used to our relationship having it's ups and downs. When things change, it's just a sign that we need to try and reconnect. Speaking of change, over the past few months, I've noticed my body has changed. I don't weigh myself anymore or spend much time looking in full length mirrors (unless I'm trying to decide which shoes to wear and in that case I spend way too much time looking in mirrors). Clothes are fitting a bit more snug. A couple pairs of jeans don't fit. Basically, I've gone up a size. I talk a lot about body positivity and self love, but I'm not going to lie and say that I'm totally 100% at peace with how my body has changed. However, I will say with 100% certainty I won't be changing how I take care of my body or feed myself. Being thin, that's an easier stance for me to take because I don't live with the constant message that my body isn't OK. Instead, I'm told my body is a "goal," a message that's rather objectifying. I've literally had distant family members tell me at my grandmother's funeral how she used to have a "thin and pretty body" like mine, so it's a good thing I'm a dietitian so I won't get fat. Seriously, WTF. She lived to be 90, was completely self sufficient, and never got sick until the very end. If having that means shrinking by 6 inches and gaining those inches around my midsection as I get older, then so be it. 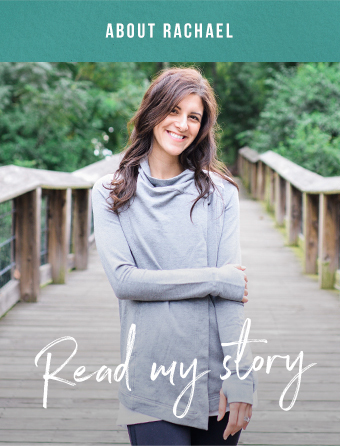 I've had dietitians tell me when I started my business three years ago that I was going to be a success because I had "the body to be a private practice dietitian." After five years as an out patient dietitian receiving almost perfect patient satisfaction surveys, apparently it was my body that would determine my success. So yeah, when you're told your body is your worth, it can be a little scary when it starts to change. But if there is anything that I've learned from my marriage it's that change, while uncomfortable, is a part of life. And the best way to get past that discomfort is to reconnect. So, I've been making a conscious effort to reconnect with my body. During yoga, I pay attention to some of the more uncomfortable physical sensations, like the rolls my stomach makes in certain poses. I've been noticing how my body looks in the mirror, not in a critical way but by being observant. Basically, I'm trying to get comfortable with what feels uncomfortable. Change is inevitable. When I imagine Scott and I in our seventies and eighties and (hopefully) nineties, we're not the same people and we don't have the same relationship and we sure as heck don't have hot bods! Because seriously, who looked around a nursing home and was like "Dayuum!!" No one. Because as we get older, our body gets further and further from conventional beauty standards, and we can make ourselves miserable fighting it, or start adjusting to it now. Today I'm sharing the dish I made the night Scott and I got engaged. I changed the recipe around a bit because hello everything I wrote above 👆 Also, the first time I made the dish it wasn't very good. I feel like there's a metaphor somewhere in there. 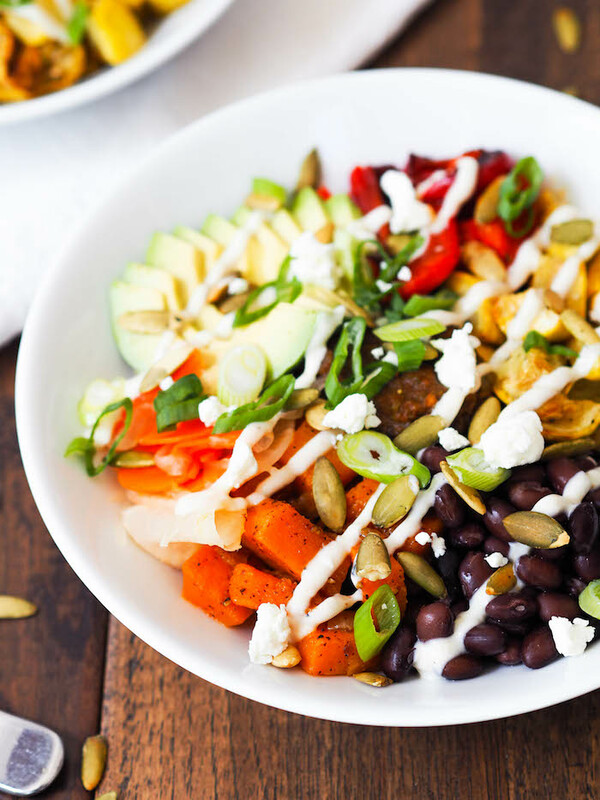 It's a fun little veggie bowl, and crazy satisfying too. Hopefully you enjoy it as much as I did (the second time around! ), and that maybe one of you will get engaged to someone awesome after making it! If so, please let me know because there is nothing I would love more than for this to become a lucky dish! Heat olive oil in a large skillet on medium-high heat. Add butternut squash and saute five minutes. Add onion, salt and pepper and continue cooking, stirring occasionally, until the squash is tender and golden, about 15 minutes. Add chili powder, cumin, coriander, lime juice and maple syrup and cook about 1 minute longer until fragrant. Meanwhile, toss squash and peppers together with olive oil and spread evenly on a large baking sheet. Season with salt and black pepper. Roast 20-25 minutes until tender and golden. While vegetables are cooking, whisk together ingredients for cumin-lime crema. Season with salt and pepper and set aside. Divide brown rice between bowls. 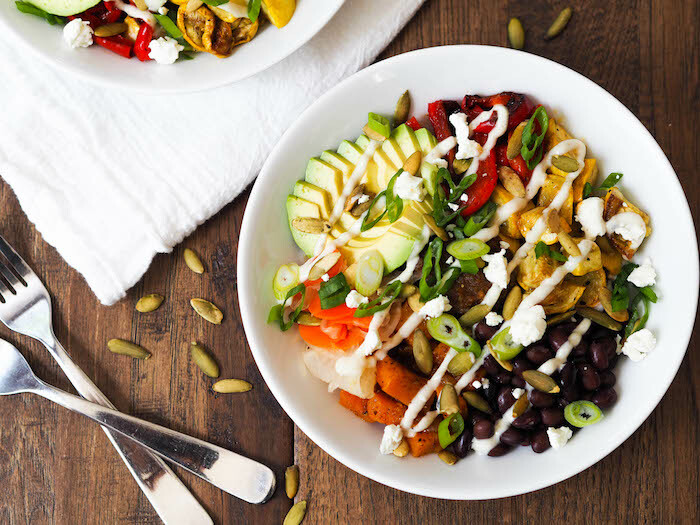 Top with black beans, avocado, fermented vegetables, roasted veggies and butternut squash. Add a scoop of salsa. Sprinkle with pepitas, goat cheese, and herbs.